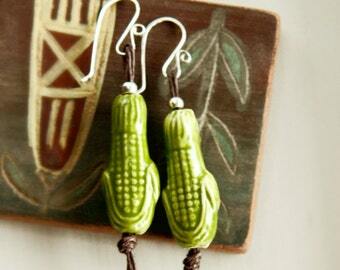 These handcrafted Acai seed earrings are eco-friendly. 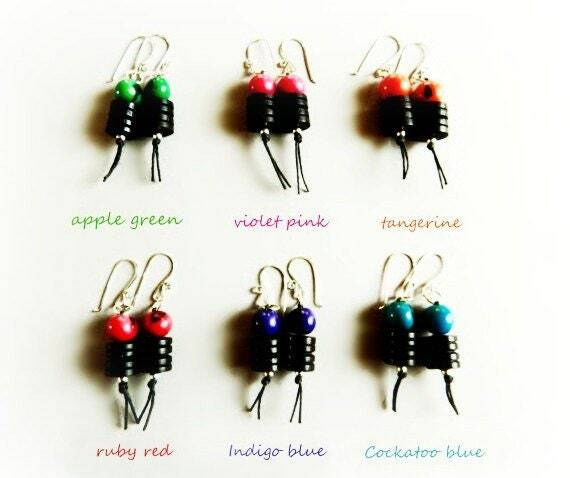 The seeds are dyed a variety of vibrant colors and sit a top a dark wood grooved cylinder tied together with a dark hemp cord with sterling silver components. This style is available in many colors. Please choose your color. If the color you would prefer is out of stock please contact me. This is an eco-friendly design, made with sustainably harvested Acai seeds from South America and Sterling silver wire obtained in raw form from a manufacturer who recycles silver. Size : 2 1/4" in length or 56 mm. ★ Acai seeds are not only a beautiful natural material but are also eco-friendly. A byproduct of the harvesting of the Acai fruit, instead of simply discarding the seed it is repurposed into beautiful jewelry and provides additional economic resources for the native people of the rain forest. ♥ Your Acai Sterling Silver earrings will arrive beautifully wrapped. All items are shipped from California by United States Postal Service First Class which takes approximately 3-5 business days for domestic mail and 10-21 business days for international depending on your location. International mail can be subject to unexpected delay. Please be aware of your countries restrictions, duty taxes or custom fees.